Ask your Contractor to add a Pre Construction Treatment to your Project! Talk to the Experts! We Can Help! Muskoka Contractors, Residents and Cottagers know all too well about Carpenter Ants and the damage they can cause. A Construction Pre-Treatment is the perfect way to prevent future Carpenter Ant colonies from finding their way into your New Build! During Construction is the perfect time to treat and prevent wood destroying pests such as Carpenter Ants in those areas that will be inaccessible after completion of your project. This could lead to expensive damage and repair in the future. 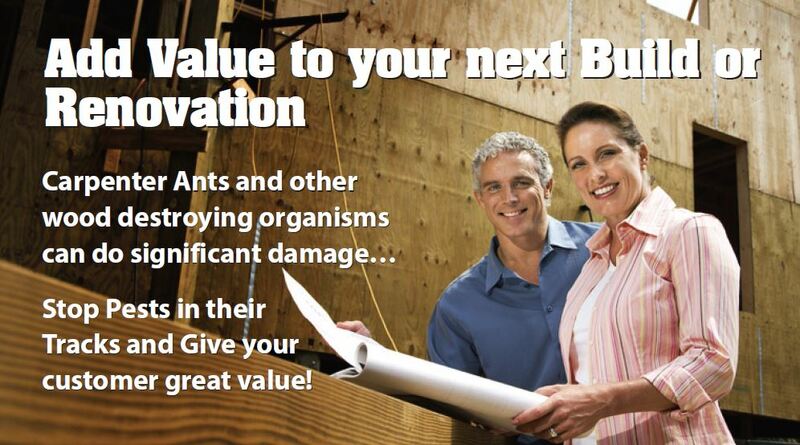 There is a solution… Talk to the Carpenter Ant Experts and find out how we can help you. Our licenced technicians have the training and knowledge you can trust to keep pests out….For Good! Call us and arrange a consultation today! We know Pests! We know Muskoka! Talk to the Local Experts!